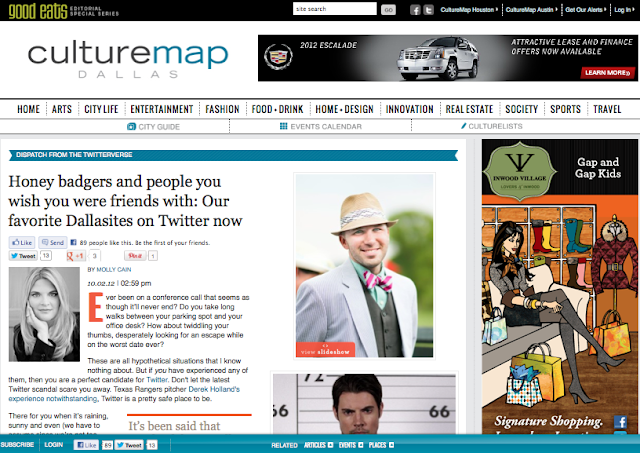 CultureMap is an online publication that's all the rage in Houston and Austin. They launched their Dallas site last week and the city's already abuzz about their content. Earlier this week, writer Molly Cain published a list of her "favorite Dallasites on Twitter" and I was flattered to make her list! Cain says about me, "You know that friend you always wish you had? Yeah, Cynthia is probably it. You’re going to want to follow Cynthia if you need a recap of the city’s most desirable “I wish I was on that guest list” events. Because she was there. Wearing something fabulous. Be warned, if you’ve told someone you’re washing your hair that night, and you wind up hanging out with Cynthia at a shindig, you could land on the front page and totally blow your cover." True that! Check out Molly's list of cool kids on twitter and join in the conversation! If we're not already connected on Twitter, you can find me @OhSoCynthia.